There comes a knock on the door or a telephone call. Words are spoken that cant be erased. A range of emotions surges like waves---shock, rage, grief, numbness. How does one cope with the loss of someone who has just died? How does one cope with a murder? Clara Maberry, a member of the New Mexico Survivors of Homicide, Inc. (NMSOH), has some answers of her own to these questions. Five years ago, her 34-year-old son, Mark Maberry, was murdered in a hotel room off of Central Ave. and San Mateo Blvd. in Albuquerque. Clara and her husband, two surviving children, grandchildren, and Marks friends have felt the effects of his death. She said they would continue to feel his absence for years to come. When Clara considered how her sons death affects her outlook on her family, she said: "I worry that my grandchildren might get hurt. They say to me, Grandma, dont worry so much! But I cant help it. The shock of a murder is so bad and so extreme. I feel unsafe." The Albuquerque Police Department reported that 75 homicides occurred last year, 1999, in Bernalillo County. Fifty of those homicides happened within Albuquerque city limits and 25 of them in unincorporated areas. The published facts dont necessarily help us understand how we, or others we know, are affected by these murders. A brochure published by the NMSOH states the following: "Homicide survivors are subjected to stresses not faced by others whose loved ones have not been murdered, e.g., media attention, protracted legal proceedings, contacts with law enforcement, and isolation at a time when they are most in need of love and support. Few people in our society know how to respond appropriately to someone who is devastated by the murder of a loved one. Consequently, survivors are often avoided." The NMSOH was officially recognized as an incorporated, non-profit group in 1997 and strives to provide that critical support, education, and advocacy for all homicide survivors in New Mexico. Clara said she has learned a lot during her involvement with the NMSOH, but more importantly, she has found some sort of peace for herself. Now, five years after her sons death, Clara said: "I dont break down as much, but theres still a void. Sometimes when I miss Mark, I also feel something else missingthe worry. I didn't realize I had so much worry about him until he was gone. Once I knew I didnt have to worry anymore, I could start healing. "Today, I just take life as it comes and I hope and pray. I believe everything happens for a reason," Clara said. She reminisced that right before he died, Mark took a train trip to California to see his grandma and extended family. This was something she said he had always wanted to do. When Clara met him at the station on his return, she said she saw a halo of light over his head. "At that moment, something told me I wouldnt have him long. Maybe it was a sign." Clara shared that many family survivors of homicide experience events that seem almost mystical. "Sometimes I feel Mark nearby and I can even smell him," she said. "I also have dreams about him. I was sleeping in the other morning, and right before I woke up, I saw him in my dream. It felt so good to see him, even in a dream." From her seat on the sofa in a comfortable back room at the office of the NMSOH, Clara shared a few photographs of Mark. He had receding, sandy blond hair and a neatly trimmed mustache. His eyes sparkled with life and he wore a smile that seemed natural and content. Clara recalled his history and his struggles. Clara and Larry Maberry moved from California to Albuquerque in 1972 with their three children, Rick, 13, Mark, 12, and Patty, 9. Clara worried about her middle son because he had developed a form of juvenile diabetes. Despite his early struggles, Mark graduated in 1978 from Rio Grande High School, attended classes at TVI in the field of respiratory therapy, lived and worked in California in **year? **and then returned to New Mexico **year?**. For 8-10 years, he held a variety of positions as a waiter in Albuquerques Old Town restaurants where people knew him well and considered him a friend. In his adult years, Mark developed macula cysts on his eyes from the diabetes. Despite 5 previous laser surgeries from the late 80s to the early 90s, he became legally blind in one eye and had trouble seeing in the other. "I worried about him a lot," Clara said. "He took insulin shots four times a day and was frequently in and out of the hospital with insulin reactions. In my heart, I feared I would lose him some day to the disease." Mark moved in with his parents in 1991 when he could no longer drive. Instead, he rode the bus to his job as a headwaiter in Albuquerques Old Town area. "He told me he had to stay independent and keep working," Clara said. "He didnt want to go on Social Security and receive disability income. He enjoyed his work." Clara said she loved having him around the house and she felt better knowing she could help him if he needed it. "Weve always been a close family," Clara said. "I loved having Mark around the house again." Just before Mark died, his younger sister, Patty, had just given birth to a baby boy. "This baby gave Mark so much pleasure," Clara said. "On the day that Mark died, he was late to work because he stopped to hold and rock the baby. When I offered him a ride to work instead of taking the bus, he said hed just be late. He didnt want me to cancel any of my appointments." 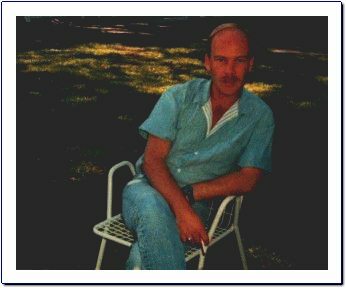 That day, on Friday, April 29, 1995, Mark went to work as the headwaiter at Conrads Downtown restaurant located in the historic La Posada de Albuquerque hotel. He usually worked until 11:30 p.m. when one of his parents would come pick him up. He called later that night to say he would be staying downtown for a friends birthday party and that hed get a hotel room for the night. Clara said she didnt think anything of it when Mark didnt come home Saturday morning from the previous nights party. Around noon, she and her daughter went shopping. "When we came back," she said, "my husband was working in the yard and he looked up at us with such a mad face that I wondered what wed done to make him so angry. Thats when he told us that Mark had been stabbed to death in a hotel room the night before. "It was like a shock through me. My daughter started crying and screaming. All I could think of was that I had to protect my family." Clara learned that a homeless man had been talking to Mark all evening at the bar where Mark and his friends were celebrating a birthday. At the end of the night, the stranger asked if he could stay with Mark in his hotel lodgings downtown and Mark allowed him to. When the hotel maid came to clean their room the next morning, she found Mark lying in blood, face down on the bed of the hotel room. Investigating police found that Mark had been stabbed more than 35 times all over his body, his spinal chord and throat cut, and his head scalped. By 1 p.m. that Saturday the police found and notified Marks family. An hour after the initial shock of the news, Clara had to call friends and family to tell them the news. "So much was going on. I was doing all of this, yet I was in a fog. I was frozen inside, but my biggest concern was taking care of the rest of my family." The next morning, Clara said she got up early, before anyone else and went into the bathroom and cried her heart out. "When you lose somebody through murder, it is just the worst," Clara confided. "There's a big red and black spot, like an explosion, inside yourself. This is not a natural death. It is not someone dying after a long illness or a long life. If my son had died from the diabetes, I could have accepted it. I can't accept this, but I have to in order to go on." When a detective came that morning to gather information on Mark, the house was already filled with family gathering for the memorial. The detective asked to meet privately with Clara. "It was a very hard thing to do by myself without my husband and my family," Clara said. "I just wanted to be helpful but I felt so numb. I'm surprised I remember much from that day." Like many survivors of homicide, Clara not only had to deal with her own loss, but she had to participate in a legal case and to talk to strangers about her son, his activities and his death. "It really scared me that my son's murder might be sensationalized," Clara said, "but we didn't get a lot of media attention because three other murders happened in Albuquerque that same weekend." Reflecting on her sons memorial, Clara said, "I remember thinking how much I didnt want this to be happening." She said it was extremely difficult not only because it was the first death in her immediate family, but also because no one knew yet who had murdered her son or why. Family and friends got up at the service to talk about Mark, others sat with Clara and told her stories about him. Restaurant friends from Old Town brought food for the family. "It was a day to celebrate his life," she said. She recalled a humorous moment during the memorial when the minister quoted her daughter, Patty, and accidentally called her Patsy Cline. "That made us laugh because one of Mark's favorite songs was, 'Walking After Midnight' by Patsy Cline and we had to ask ourselves, Did Mark make the minister do that?"
Eventually family had to leave and go back home. "It got rough then," Clara said, "because I had to keep going and live each day at a time." She observed that the grieving process takes different forms for different people. "My husband still has a hard time dealing with Marks death and doesn't really want to talk about it because he says it hurts too much. He doesn't get involved with any support programs, but he is supportive of my desire to do so," Clara said. She said that her daughter, Patty, talks freely and tells stories about Mark to her 5-year-old son, but older son, Rick, avoids referring to Mark for fear of upsetting the family. "Sometimes, though, when we all get together we will start remembering the fun times we had as a family with Mark," Clara said. "I really enjoy that." Six months after Marks death Clara said she started looking for outside support and found a pamphlet describing the Grief Services Program offered through the New Mexico Office of the Medical Investigator (OMI). In 1995, grief counselors Ed Candelaria and Liz Adkins from the OMI held two 8-week support groups to serve about 20 families in the Albuquerque Metropolitan Area whose children had been murdered. After the first 8 weeks ended, members said they felt so close that they wanted to keep meeting regularly each month. Candelaria and Adkins continued to facilitate these gatherings at the OMI over the next four years. The meetings allowed members to grieve and process their experiences together. Adkins said, "Sometimes family and friends of a murder victim feel like theyre really going crazy, but when they come together to talk, they can see their feelings are normal under the circumstances." Clara commented on the support group: "Sometimes I'd leave in worse shape than when I got there. I'd get home and wonder why I went, but then, by the next month I'd be ready to go again. Bringing up my son's death hurt, but it was also helpful. It was like nourishment to talk about it and I kept coming back for more." Clara said she felt relief when Marks alleged murderer was found two weeks after the killing. Her family attended three court dates over a years time for the indictment, plea-bargaining and sentencing. "It was hard to wait for it to be over," she said, but noted that having the support group gave her strength. "The other survivors read the newspapers and kept up with the case. We talked about it at our meetings and I could share what was happening with me." Clara said her reaction to the accused man surprised her. "I had already seen the composite drawing of the alleged murderer and later, his face on TV, but seeing him in the courtroom filled me with an anger I didn't know I had in me," Clara said. "During one court date, he looked over and smirked at us. I don't know if it was really a nervous laugh, but it was a smirk to me. What really upset me," Clara continued, "was that this man left Mark to suffer and die alone." The accused man plea-bargained from first-degree murder down to second-degree murder and was sentenced to 15 years in prison. Clara said he would probably serve 7 � years and then be released on parole, but she said her familys case had achieved a better outcome than many survivors had. "The judge did what he could do as far as giving justice. It made me feel better that he let me, my husband, my son, and my daughter speak at the sentencing. The murderer could say whatever he wanted, but someone got to speak for my son." The Maberrys waited until a year after the sentencing and two years after Marks death to scatter his ashes. "We didn't want to give him up before then," Clara said, "but he was a free-spirited person in many ways and we knew we had to let him go." This May 26, 2000 would have been Marks 40th birthday. For the last four years, Clara and her family have celebrated his birth and life by going camping together at a special place in the mountains. "We can at least be with him spiritually," she said. Remembering Marks life and his attributes helps in the healing process, Clara said. "In the restaurant business, Mark met many different people. He was very outgoing and friendly and he liked everybody. When he had problems, everyone knew. When they had them, he knew." Clara said she was proud of her sons friendships. "He was not prejudiced whatsoever and had Indian, Black, Spanish, and Mexican friends. Besides being legally blind in one eye, I think he was color blind too," she said with a warm laugh. On days when she felt particularly sad or empty, one of Marks friends would call her up out of the blue and want to talk. She said that these little brushes with her sons old circles lighten her sorrow. She said, "I realized its not just the family that grieves, but also the friends. "I know I cant change anything that happened," Clara said. "We have to continue living, like were supposed to. Sometimes I shock myself by getting very angry about his death, but usually when that happens, I try to get busy with a project." Thats where Clara said her work comes in with the NMSOH. Clara continues to volunteer her time at the NMSOH. She takes calls, does office, attends its weekly support meetings, and helps represent the group in its public activities. "It makes me happy to be able to help other people. I need that interaction," she said. "Sometimes your family wants to get over the event, but maybe you want to keep talking about it. With other, less traumatic deaths, people tend to get on with their lives and let go. A murder is different because you just don't know why it happened. The murderer gives certain reasons, but you still don't really know why." Recently, Clara participated with a group of students from Albuquerques Technical Vocational Institute in a project to create a public town hall meeting which occurred on March 2 to address issues surrounding homicide in New Mexico. She is helping to plan this years NMSOH Annual Conference to be held in **city** on**date?**. Clara also serves on a committee with students from the UNM school of Architecture who are designing a State Memorial Wall to be constructed in an Albuquerque public park. In 1997, the NMSOH became an incorporated, non-profit group. It opened its first office in Albuquerque in 1999. Since its inception in 1995, NMSOH chapters formed in Farmington, Las Cruces, and Taos-Rio Arriba counties. The organization is trying to start additional chapters in Roswell and Gallup to support families like Claras in their grieving and healing processes. The Grief Services Program continues to address issues surrounding traumatic death (including: prenatal and infant death, accidental death, homicide, suicide and unexpected natural cause) and offers crisis services, support group facilitation, advocacy, education and referrals to community resources for bereaved families and the community.